Major landmarks: The Ylaya Commercial Center at the corner of C.M. Recto Ave. and the Fiesta Shopping Plaza across the street; Tondo Church and The Holy Child Catholic School at its northern end (near P. Herrera St.); Juan Luna Bridge if coming from Binondo, across from Juan Luna Volunteer’s Fire Brigade near Juan Luna St.
Goods on the street: Textile (wholesale and retail), sewing needs, ribbons and buttons, shirts and school uniforms for wholesale, jeans and RTWs and other things including kitchenware, party supplies and souvenirs, parlor supplies, socks and other undergarments, and novelty items. Details worth noting: Ylaya is one of Divisoria’s busiest streets, with jeeps going to other parts of Manila clogging its tip. 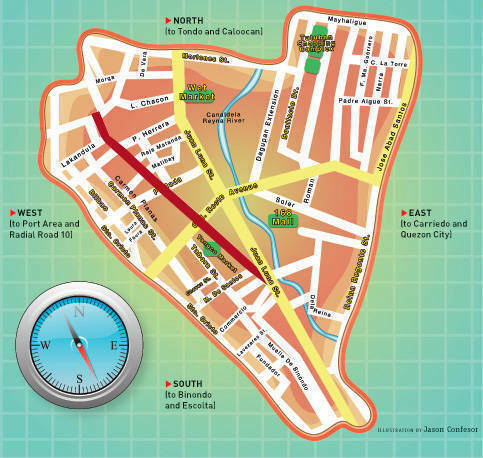 The Tomas Mapua 24-Hour Bakery is on the street’s northern end, near the Tondo Church and the corner of Aguirre St. Major banks and drugstores also line this stretch. Dissecting Divi divisoria textile Ylaya St.